SmartWater Technology has unveiled a system to help minimise the theft of critical underground infrastructure. SEAL has been developed to restrict access to underground networks and other infrastructure that are the target of metal thieves. SEAL consists of two key components – an extendable steel brace, which prevents intrusion, and a bespoke, mouldable bag which is customised to fit almost any shape or size required. The bag is fitted with forensically coded SmartWater SmartGel, which is uniquely registered to the location of the device’s deployment. Openreach, a BT Group Business, has become the first organisation in the UK to deploy SEAL, after initially approaching SmartWater about developing a product to combat underground infrastructure theft. Devices are now in use at high-risk locations, none of which have been attacked since their installation. Should a manhole cover be removed illegally, SEAL will protect the site from opportunistic thieves looking to target underground cabling and infrastructure. It can also act as a temporary health and safety measure to reduce risk of injury to the public whilst a replacement manhole cover is sourced. 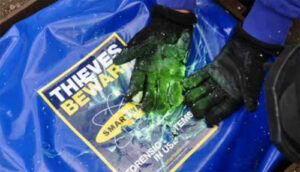 In the event of a criminal attack on SEAL, the mouldable bag will rupture, covering tools, clothes and hands in SmartGel. Any traces of the gel will glow brightly under UV light, providing a forensic link between the criminal and the crime scene. The gel will remain on skin and hair for many weeks and is virtually impossible to remove from clothing, footwear and tools.